Silicone Keyboard Cover Skin for Apple Macbook Pro MAC 13.3" 15.4" 17" and Macbook Air 13. The keywords is printed on the keyboard cover. Soft durable rubbery silicone material. Flexible, washable, easy to apply and remove for cleaning or disinfecting. 100% fit for ALL the latest Macbook including: Macbook white 13" unibody /Macbook Pro aluminum unibody 13" 15" 17" and also the Wireless Keyboard. Dimensions: approximately 28.7cm x 11.9cm/11.3inch x 4.69inch. This keyboard cover only fits US model, not EU model. the EU version: "enter" key looks like "7". the US version: "enter" key is rectangle, as normal as other keys. 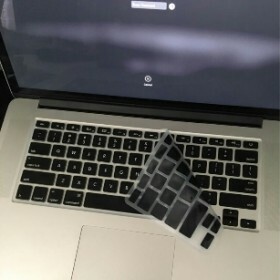 1 x Keyboard Silicone Cover Skin for Apple Macbook Pro 13 15 17 Air 13. 08123699579, We Deal In Handmade Bags Purse Slippers. We Are Into Cultivation, Processing And Sale Of Different Types Of Edible And Medicinal Mushrooms Like Oyster, Shiitake, Reishi (both Fresh &amp; Dried) And Other Vegetables In Commercial Quantities. 08147437340 We Are Just A Call Away To Get You The Dream Outfit Perfect For That Wonderful Occasion.we Deal With All Kind Of Wears Casuals, Native, Male And Female And Yes We Even Got Your Kids Covered.